Today I’m going to show you how to make an adorable, easy Turkey Cake with buttercream and chocolate! This design is great for all skill levels of cake decorating, and would be the perfect addition to any Thanksgiving dessert table! Kids are sure to love this funny, colorful turkey design. With brushstroke chocolate shards being so popular in cake decorating, I wanted to incorporate some chocolate turkey feathers into my design for a little added height and color! I was also inspired by The First Year’s Turkey Cake that popped up in my Pinterest feed. We created our chocolate feathers differently, but her technique of incorporating shards of chocolate is a great one also (and doesn’t require piping). Americolor Black Pen- Use any food writer pen you like for the eyes, or substitute with black fondant, black candy/chocolate chips, or buttercream. Piping tip: I used a Wilton 3 tip for the bead border around the base. Make your chocolate feathers fairly thick so that they will not be as fragile. The feathers will soften slightly when inserted into the cake and so a slightly thicker feather will hold up best. Chill the feathers in the freezer for 5-10 minutes just before handling & inserting into the cake. Make a few extra feathers and a wing or two extra to be on the safe side. We used the “hot knife method” for smoothing our buttercream which involved chilling the freshly frosted cake for about 10-15 minutes or until frosting is firm before going over it with a heated spatula/bench scraper. Use your smoothing method of choice, or you can texture the buttercream with your spatula. Anything goes! If you’d rather not make chocolate wings, use a leaf tip (366) or similar tip to create chocolate buttercream feathers/wings on each side. Looking for more Thanksgiving cake tutorials, recipes, and ideas? 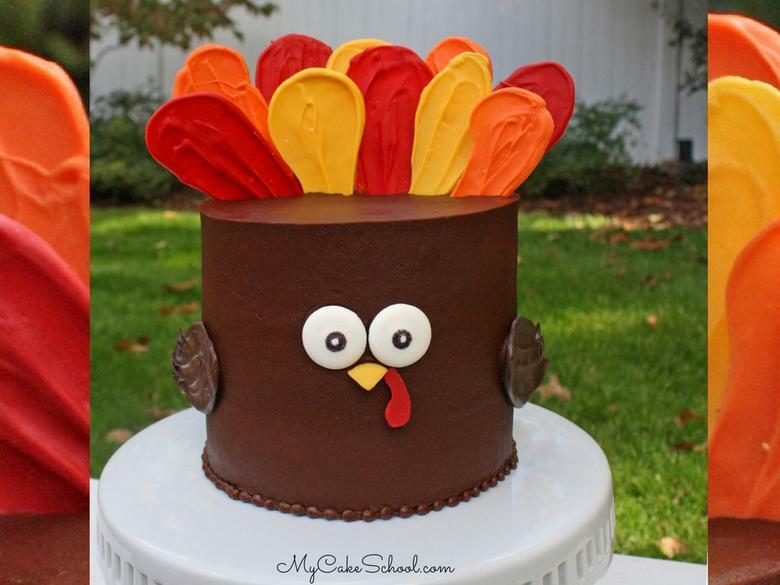 Make sure to check out our roundup of favorite Thanksgiving cake designs! You can find it here: Roundup of the BEST Thanksgiving Cake Recipes, Tutorials, and Ideas! Thanks for stopping by! If you’d like to see more free cake tutorials, don’t miss our Free Cake Tutorials section. Also, our tried and true cake and frosting recipes can be found in our Recipes Section. Finally, if you are interested in accessing our entire cake video library, you should consider becoming a member of MyCakeSchool.com! You can find all of the details here: Joining Information for MyCakeSchool.com. We would love to have you! Well now that is super cute! :-) Love it! 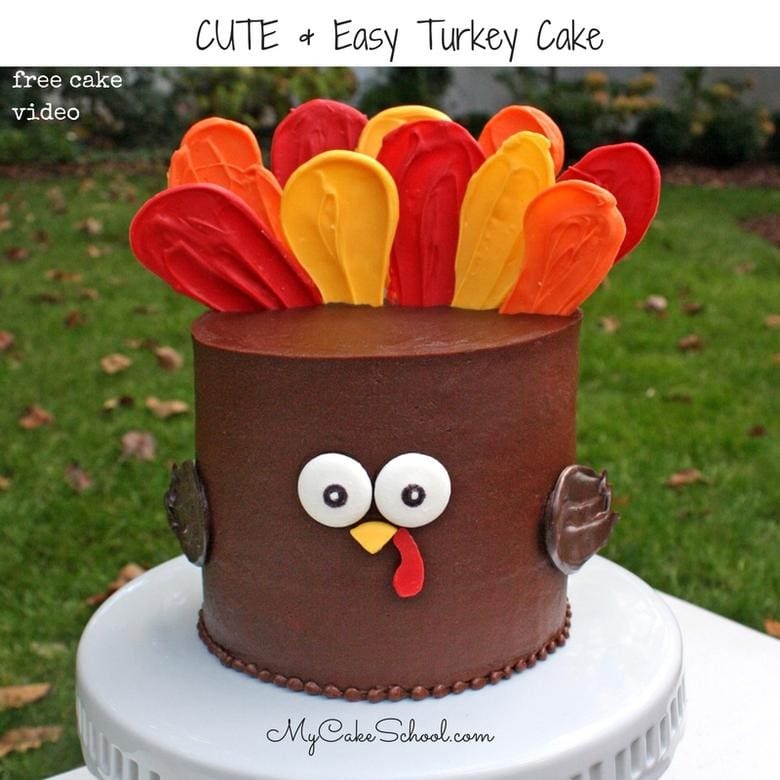 This turkey cake is absolutely adorable! It’s on my to do list! So cute! I recently started decorating cakes and love it. I’m sure you already know this, but if you put a piece of rubber between the cake board and turn table it stops the cake from moving around on you. This cake makes me so happy! Did you use a cake board between any of the layers since it is taller that two layers? Oops! I watched the video again and my question was answered. Thanks!